The OME data hierarchy (images --> datasets --> projects) along with the classification hierarchy (images --> categories --> category groups) provide an organisational framework for aggregating your data into cohesive conceptual units. User mutable free-text descriptions are applicable at all levels of the hierarchy and work as a mnemonic for future retrieval. 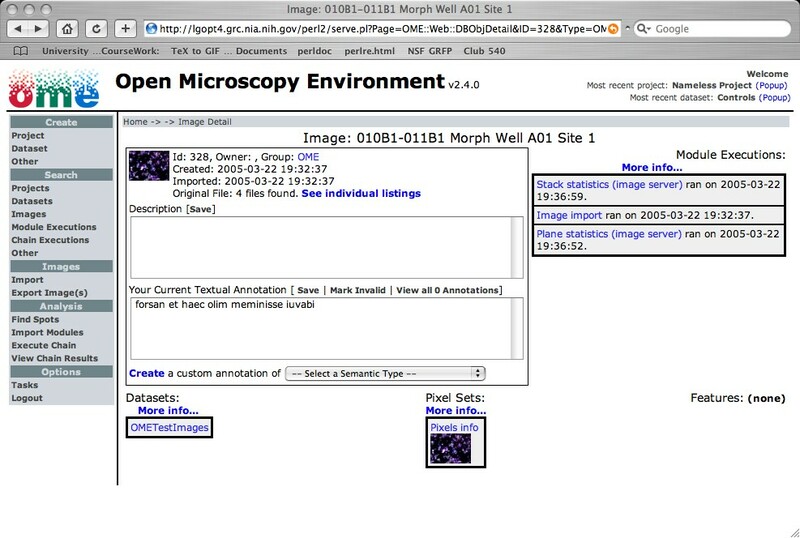 OME also supports structured annotation, based on semantic types, that can be applied at three levels of the hierarchy (images, datasets, and global). Annotations, through their semantic type architecture, are intended to be used as an ontology. Unlike descriptions, annotations cannot be deleted but instead are revisioned. Annotations are always associated with the experimenter who created them. This has several implications. One of them is that multiple experimenters can make different coexisting annotations for a single image. Another is that annotations are subject to access control and are not globally accessible to all users. Images can be retrieved using the search interface based, amongst other things, on their annotations.